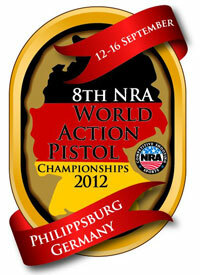 The 8th Annual NRA World Action Pistol Championship (WAPC) takes place September 12-16 in Phillipsburg, Germany. The event will be held at Schießanlage Philippsburg (Shooting Philippsburg), Germany’s largest indoor/outdoor Shooting Range. Located roughly 23 miles from Heidelberg in the Bavarian countryside, the Phillippsburg Range has previously hosted German and European shooting Championships. The 8th Annual WAPC is a Bianchi Cup-style event with individual and team World Championships up for grabs with four firearms classes: Open Class, Open Modified Class, Metallic Sights Class, Production Class. There are also separate titles awarded for Aggregate World Champion, Revolver World Champion, Ladies World Champion, Senior World Champion, and Junior World Champion. Competitors will include ace American shooters Doug Koenig, Bruce Piatt, Jessie Duff, Julie Golob and Louis Surgi. Representing the NRA in Germany will be Competitive Shooting Director Dennis Willing, NRA National Pistol Manager Tom Hughes, and other NRA personnel. Dennis and his crew will spend five days in Phillippsburg covering the event. Hughes is happy to make the trip. They are going to hold a Bavarian style barbeque,” said Hughes. “When I was stationed in Germany, I never had the opportunity to attend one of those so I’m looking forward to it.” To learn more about the 8th Annual NRA World Action Pistol Championship, visit the WAPC website at www.8wapc.com. Share the post "World Action Pistol Championship in Germany September 12-16"